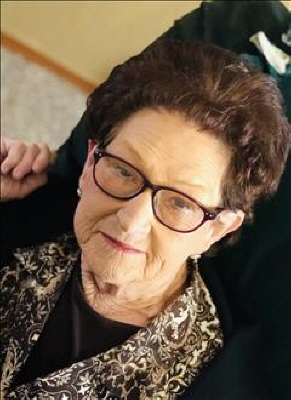 Lou Ann Dunlap, age 81, passed peacefully from this earth to her heavenly home on April 4, 2019 surrounded by her family. She was born on September 26, 1937 in Ada to Clifford and Inez Moore Miller. Lou Ann graduated from Vanoss High School in 1957, and would later marry Frank A. Dunlap Sr on July 31, 1967. She is survived by two daughters, Cynthia Howard and CR of Ada, Dianne Couch and Rodney of Kiowa. Five grandchildren, Bridget Langley and Paul of Ada, Amber Vandever and Isaac of Ada, Shyra Nunley and Dalton of Calvin, Shane Langley and Sarah of Allen, and Frankie Howard of Kiowa, 10 great grandchildren, Addisyn, Gator, Hunter, Lathan, Harley, Hayden, Jameson, Daxton, Brox, and Tatum. One Sister Jean Elliott and Jerry of Vanoss. One brother Dale Miller and Pam of Vanoss, and a host of nieces, nephews, relatives and long time friends and neighbors. All whom loved her dearly and will never forget her tenacity, wit, charm, grace (when pertinent) and undying love and caring for them. She was proceeded in death by her parents and spouse. Lou Ann worked at Brockway Glass Plant for 25 years until December 31, 1991 when the plant shut down. She then later became employed with Health South Physical Therapy where she worked until retirement. Alongside her fulltime jobs, she worked in the church nursery at Morris Memorial Baptist Church until 2015 when a decline in her health she was unable to continue. Lou Ann was a member of the Latta New Hope Pentecostal Church, where she attended until the very end of her days. Lou Ann was a dedicated mother, grandmother, great grandmother, sister, aunt and friend. She treasured her grand children, especially the great grandchildren and embraced each and every moment with them. She had a vivacious personality and always made people around her laugh, as well as her keen ability to make friend anywhere and any given time. She enjoyed working in the yard, sewing, rocking babies, having lunch with "her Brockway gals," and playing with her dog Minnie, attending any event she could at Vanoss watching the great grandkids and feeding pigs, just to name a few of her favorites. Lastly she had a huge love for her corndogs and mountain dew! Her life was a living example of Ephesians 4:32 "And be kind and compassionate to one another, forgiving one another, just as God forgave you." Please join us in a celebration of Lou Ann's life on Saturday, April 13, 2019 at 2:00 p.m. at the Latta New Hope Pentecostal Church, 13695 W. 32nd Ada, Ok which is straight west of Latta School. To send flowers or a remembrance gift to the family of Lou Ann Dunlap, please visit our Tribute Store. "Email Address" would like to share the life celebration of Lou Ann Dunlap. Click on the "link" to go to share a favorite memory or leave a condolence message for the family.